Bilingualism is the ability to communicate in two languages with equal, or near equal, fluency. Decide and clearly state the minimum language proficiency that is suitable for your workplace. Clearly establish a minimum level of language proficiency that is applicable in a bilingual context (for example, you may require the accepted level of fluency to be consistent across both languages or you may require fluency in one language and only reading proficiency in the other language). Employees who agree to communicate in English and a LOTE and who are not employed as qualified interpreters are broadly called bilingual staff. 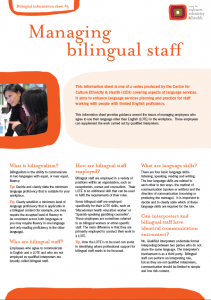 How are bilingual staff employed? Bilingual staff are employed in a variety of positions within an organisation, such as receptionists, nurses and counsellors. Their LOTE is an additional skill that can be used to fulfil the requirements of their roles. Some bilingual staff are employed specifically for their LOTE skills, such as ‘Macedonian health education worker’ or ‘Spanish-speaking gambling counsellor’. These employees are sometimes referred to as bilingual workers or ethno-specific staff. The main difference is that they are primarily employed to conduct their work in a LOTE. Tips: How the LOTE is to be used can assist in identifying where professional support for bilingual staff needs to be focussed. There are four basic language skills: listening, speaking, reading and writing. The four language skills are related to each other in two ways: the method of communication (spoken or written) and the direction of communication (receiving or producing the message). It is important to decide and to clearly state which of these language skills are required for the role. Can interpreters and bilingual staff have identical communication encounters? No. Qualified interpreters undertake formal interpreting between two parties who do not share the same language. The interpreter’s involvement is as a third party. Bilingual staff can perform an interpreting role, but as they are not qualified interpreters, communication should be limited to simple and low risk content. An additional role bilingual staff perform is communicating directly with a client in a shared language other than English. Usually this communication is within their occupational role; for example, as a receptionist or gambling counsellor. To determine what support needs to be offered to bilingual staff and the level of risk involved in communicating in a LOTE, your organisation needs to decide whether bilingual staff will be expected to communicate in a two-way language encounter, a three-way language encounter, or both. Bilingual staff should be used to fill simple communication gaps in situations where there are low levels of risk. How the LOTE will be used can impact on the time and workload of bilingual staff. What is a language assessment? Language is an acquired skill developed over time and this skill is measured through assessment. Often, English is assessed through the job application and interview process. Currently, there are no nationally accepted standards, qualifications or assessment measures for bilingual staff who use a LOTE in their work. This is largely because testing must be context specific, as the vocabulary required depends on the nature of the work. In the absence of a formal assessment, informal language assessments can be conducted in the LOTE by somebody familiar with the job (such as an ethnospecific agency that delivers aged care services). Ideally, the assessment should be separated into the four language skills: listening, speaking, reading and writing. Bilingual staff should receive risk management education about LOTE used as part of service delivery. Government agencies, such as the Office of Multicultural Affairs and Citizenship, have established benchmarks for translating and interpreting services. These can help you to develop a framework for assessing the skill levels of your bilingual staff. Unless specifically recruited to use their LOTE, it is important to seek employees’ permission to use their LOTE skills. Clarifying how and where the LOTE is used, including the frequency of its use, will avoid confusion. This should be done through mutual agreement between bilingual staff and management. Appropriate remuneration encourages staff to develop and use their LOTE in their work and can be tied to ensuring quality of service delivery. Some organisations pay a flat allowance and annually review the demand for a particular language. All employees should know who is willing and able to offer their LOTE skills. A register of bilingual staff, accompanied by guidelines on how to access and work with these staff, can be developed and promoted. The use of LOTE should be recognised in position descriptions and work plans. Booking and briefing an interpreter (2014): Getting the best interpreter starts at the booking stage.